Following an In-Place upgrade we wanted to enable server-side conversation history as its a new feature in Skype for Business and we already had Exchange 2013 available which is a prerequisite for this feature. Server-side conversation history allows conversation history to be shared between desktop and mobile clients which was often a major pain that conversations on your Lync mobile client was separate and a nightmare to manage 😦 boo. Enable settings in Skype for Business. This was set to false and i used to enable this in the global policy. Please note all client policies will need this to be true if more client policies exist. The experience i have found using the most up to date Lync Mobile clients for Windows Phone, IoS and Andriod. ios – works great and seems to work the best user experience of the three clients. Windows Phone – works but wasn’t refreshing. Removes option for delete all conversations and adds a refresh button instead but i couldn’t get this to work. Items to check and are also required if not working following client policy enabling. 1. 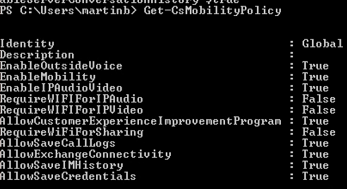 From Skype for Business Management Shell check is Server Side conversation history is enabled first. This was enabled by default for me. Partnership and use test connectivity to ensure all exchange tests are succesful. So, if we upgraded from Lync 2013 to Skype for Business Server 2015 and continued to use our existing Exchange 2010 server, will conversation history just work like it did before (i.e. separate logs for mobile and desktop) ? What would happen if we happen to go to Exchange 2013 and be mixed with Exchange 2010 in regards to conversation history ? Hi John, thanks for reading my post. If you have Exchange 2010 then your correct, it will stay the same as Lync 2013 and you will have separate conversation history for the desktop and mobile clients. The users mailbox has to be on Exchange 2013 and you would have to enable server side conversation history and set up the parter ship between SfB and Exchange 2013 first before your users get server side conv history. I’m not quite understand where it will save history. On the Exchange server or S4B server? It saves it in the users mailbox in the conversation history folder. Both the desktop and mobile client can now access this folder. Before the mobile client stored conversations on the mobile device and it wasn’t shared or accessible between the desktop and mobile clients. It’s a nice feature. Hope that helps. Now I understand. Thank you! Thank you for the reply. It makes sense now. Hey Martin! Great post, and thanks. Quick question, have you gotten any further, or found any official MS announcements, about the Android client not working for this? I am trying to find anything at all on it, but not having much luck. Pingback: Skype for Business Enable Server Side Conversation History | Universal Communications, My experiences.